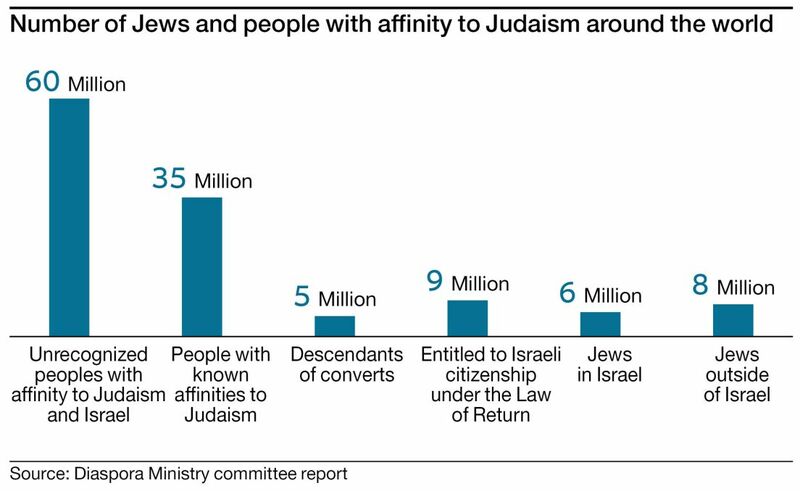 A committee appointed by Israel's Diaspora Affairs minister says that there are some 60 million people around the world with an "affinity" to Judaism or Israel. The committee says that among them there are communities that could be brought to Israel and converted to Judaism. The committee's recommendations call for reaching out to these communities and introducing them to content related to Israel and Judaism. In response to the report, the ministry said that the committee's recommendations have not yet been adopted and their goal is to strengthen ties with those who feel an affinity to Israel and not to push for mass conversions to Judaism. 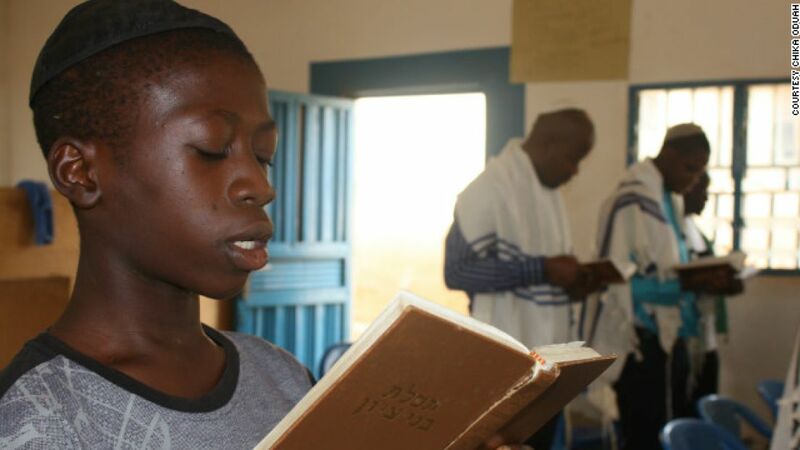 >> From the Amazon to China: A look at the 'Jew-ish' groups Israel is trying to bring into the fold ■ African, black – and part of the global Jewish community? The committee was set up in 2016 by the ministry to examine Israel's policies towards the "large communities" that in recent years, according to the report, have asked for recognition from Israel, ties with the Jewish state, aid and even citizenship. The committee handed in its recommendations to the government on Sunday, calling for formulating a plan to identify those who have certain links to Judaism but are not currently eligible for immigration under Israel's Law of Return, and introduce to their communities to the study of Judaism, Hebrew language and Jewish and Israeli culture, as well as creating a new framework for bringing appropriate individuals, groups and entire communities to Israel for conversion. The recommendations were partially revealed by Haaretz last year and the project would, if accepted by Israel's government, kick off in 2019. The committee's report said Israel faces an "unprecedented strategic opportunity to bring these groups closer to the Jewish people through a clear program open to those interested in joining the Jewish people." However, the committee said, despite the "massive growth in [the aforementioned] communities and groups" over the past two decades, Israel is ill prepared to address to them and there is no official authority "investing significant resources or regularly dealing and researching" them. The committee on "Israel's ties with communities around the world with an affinity to the Jewish people" presented its report to the cabinet, which is set to discuss the recommendations at a later date. The committee was established in 2016 by the Diaspora Affairs Ministry, which is headed by Education Minister Naftali Bennett, the chairman of the Habayit Hayehudi party. The committee’s goal was to recommend a policy to the government concerning the “large communities” that have asked Israel for recognition, aid, and sometimes even citizenship. The report suggested beginning to map these communities, reaching out to them, offering them lessons in Judaism and on Israel, as well as examining potential joint work in the field of "public diplomacy to promote support for Israel and aid in the struggle against anti-Semitism." Dvir Kahane, the director general of the Diaspora Affairs Ministry, wrote in the introduction to the report that "we are talking about tens of millions of people" who could be sources of "connections, affinity and support for the Jewish people and Israel." According to the report, these groups include descendants of Jews who are ineligible for the Law of Return, such as Jewish converts; communities who claim to be Jewish but still need to undergo conversion such as the Falash Mura (Beta Israel) from Ethiopia or the Bnei Menashe from India; descendants of forced converts in Spain, Portugal, France, Italy, South America and the southwestern U.S.; descendants of Eastern Europeans who hid their faith under communist regimes; communities in Africa and Asia that claim a more distant connection to the Jewish people; and groups around the world with "a desire for an ideological and spiritual affinity ." As part of the attempts to estimate the number of people who could possibly be involved, the committee sketched out five “circles of affinity." The first group is the Jewish “core” with over 14 million people who are commonly recognized as Jews. The second group is comprised of nine million people who qualifying for Israeli citizenship under the Law of Return, including their family members. The third group includes the more than five million people who can be considered "distant relatives" of Jews. The fourth group includes some 35 million people who have “declared their affinity to the Jewish people,” such as the descendants of communities that were forced to abandon their Judaism. The fifth and last group is the largest, about 60 million people, described as having “future potential" as "descendants of Jews, descendants of forced converts, and additional communities with an affinity to the Jewish people but are not currently declaring so or are unaware of it." The committee recommended establishing a special unit in the Diaspora Ministry that later become a government authority and a national research institute to gather information on the communities and establish contact with them. As a first step, the unit would focus in the next two years on a pilot program among the communities of descendants of forced converts, which is the largest group with an affinity, according to the report. The goals of the program over the next two years would be to carry out public relations and information work in Israel and all over the world on the matter of the forced converts to create broader awareness. The second goal is to survey and map out the communities in detail, followed by cooperation, coordination and aid to the communities for educational and public diplomacy projects. The last stage would be “harnessing the communities of the descendants of the forced converts on behalf of support for Israel.” Another part of the project would include preparing lesson plans on Judaism, Hebrew, Jewish culture and Israel. The courses would be taught by teachers from the different countries involved after the instructors go through a short training program. The report further recommended establishing a government website to digitize the information, including the possibility of genealogical databases, and to distribute information on Judaism, Israel and the Hebrew language. They would also offer the possibility of visits to Israel and studying here, as well as information on Israeli law and regulations – as well as the possibility of conversion to Judaism through the official conversion system. The Diaspora Ministry should also encourage academic research on the matter along with training the communal leadership of the groups, the committee said. In addition, the communal leaders should be brought to visit Israel and be offered academic courses and full degree programs. Participation in programs such as Birthright or the Jewish Agency’s Masa program would be considered for the groups, or perhaps the establishment of a new program designed specifically for such groups – a sort of Birthright for the descendants of forced converts. In the long term, starting in 2022, the committee recommended that the government train specific employees in all Israeli diplomatic missions around the world to be responsible for the ties with these communities. In addition, the Population and Immigration Authority in the Interior Ministry would have to be brought into the picture to arrange special entry permits and visas for these communities to visit Israel, and study and work here. The Strategic Affairs Ministry would also be involved in cooperating with such communities in its battle against the Boycott, Divestment and Sanctions movement. The committee also recommended considering expanding the “Israel Houses” program that maintains contact with and provides information for those considering immigration or returning to Israel. 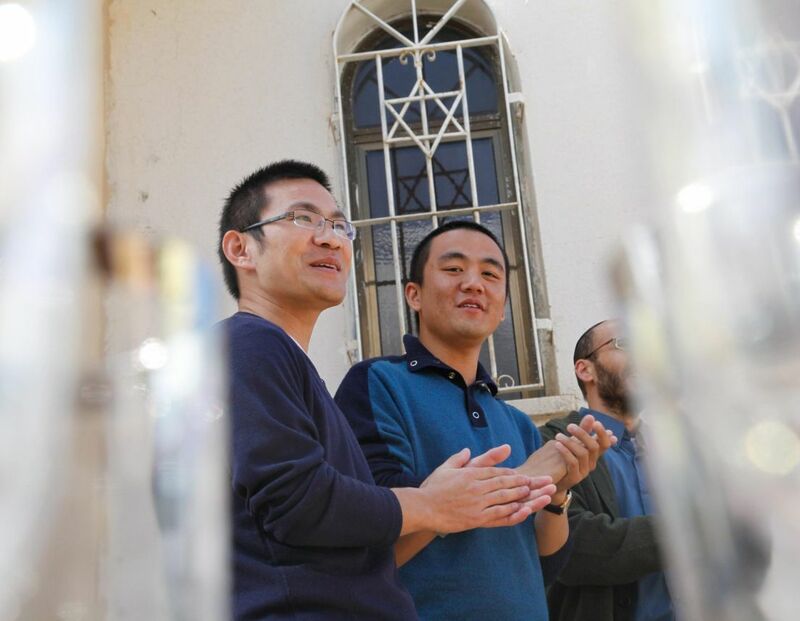 The Israel Houses could be used to help spread Jewish and Israeli culture, in the same way the Goethe Institute, Institut Francais and British Council do. The members of the committee include historian Dr. Ofir Haivry, Prof. Benjamin Ish-Shalom, former cabinet secretary Zvi Hauser, Rotem Yadlin and Fiamma Nirenstein. In response to the report, a statement said that "the Diaspora Ministry appointed an independent committee to examine Israel's approach to communities that are not Jewish but have an affinity to the Jewish people. Upon completion of its work, the committee submitted its report to the Diaspora Ministry for further discussion of the matter. "The committee found that there is an unprecedented opportunity to build cooperation with these communities and thus to turn them into a strategic asset for the Jewish people and for Israel in the international community. The committee does not at all recommend working for the conversion of immigration of these communities. The Diaspora Ministry has received the report and initiated a government discussion to consider the committee's recommendations."